During the first season of the TV sitcom "Happy Days," Howard and Marion Cunningham had three children: Chuck, Richie, and Joanie. Now, you probably know Richie (Ron Howard), and you're probably familiar with Joanie (Erin Moran), but Chuck (played by two different actors, Gavan O’Herlihy and Randolph Roberts, which couldn't have helped) may be news to some. The story was that Chuck was the oldest, and played basketball at the University of Wisconsin-Milwaukee. His contribution to the show was, I'm told, mainly brief appearances on the way to or from basketball practice: the writers didn't know what to do with him beyond that. At the beginning of the second season, he was written out of the show with the explanation that he was going to college (though he had already been going to college), and he was never seen or mentioned again. Subsequent episodes had Howard and/or Marion saying explicitly that they only had two children. 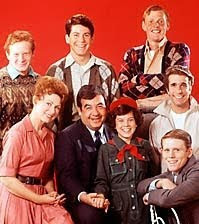 The "Happy Days" cast. Chuck (Gavan O’Herlihy? Probably?) is in the upper right corner. This sort of thing has happened in a surprisingly large number of shows,1 often enough to be given its own name, "Chuck Cunningham syndrome." It's really kind of an odd thing to have happen: I can see the occasional need to drop an actor, but if they just vanish without explanation and are never mentioned again, it seems like the writers have failed at some point along the way. Maybe it's more complicated than that. Anyway. My point in bringing this up is that CCS happens to houseplants sometimes as well. A variegated Pandanus veitchii, better known to PATSP readers as the Big Damn Screw Pine, or BDSP. I've probably seen more pictures of screw pines in houseplant books than I have individual plants for sale. I can say this about other plants too,2 of course. But it stands out with Pandanus, because so many books and websites mention them in part to say they're awesome houseplants. 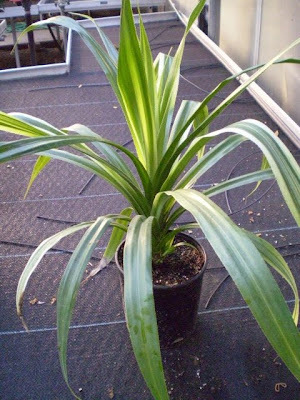 I found one site that actually called Pandanus "the best houseplant there is. "3 I don't know if they used to be widely available and then disappeared, or if they were always rare, but it's weird that a plant that is as dramatic, and easy to grow as this isn't seen at least occasionally in the stores. I got most of my plants from my ex-job, which is also the only place I've ever seen them for sale; a few others came to me by trade. Screw pines never sold that well at work, of course; in the whole year and a half I was there, we only sold one plant to a regular customer, a very large non-variegated P. veitchii which had been there for at least a couple years by the time it sold. Perhaps that answers my question about why we don't see more of them: maybe when stores do bother to get them in, they don't sell. And I don't blame the customers. Screw pines are kind of mean. Both P. utilis and P. veitchii have three rows of hooked, sharp spines running the length of the leaves, one on each side of the leaf and then another on the underside along the midrib. The spines are pointed outward, so reaching in toward the center of the plant means you're going to get scratched, however careful you try to be. Worse, the scratches tend to hurt and itch longer than ordinary scratches. I found rumors on-line that this might be because the spines contain calcium oxalate crystals, but was unable to verify.4 They also cause the occasional allergic reaction, but I don't know how common this is, or how serious it is when it does happen. So they're unpleasant to get close to. But even so, this is hardly a reason to disappear the whole genus from sale. Yucca guatemalensis have serrated leaf margins; some Aechmea and Neoregelia cultivars have marginal spines very much like Pandanus but sharper; Pachypodium lamerei's trunk is spines from bottom to top; all kinds of Agave species are sharp and pointy; nearly the entire Cactaceae family is covered in spines; and a solid percentage of Euphorbias are both pointy and toxic. And everybody still sells all of them. So why wouldn't customers buy Pandanus? I honestly have no idea. Perhaps, like the "Happy Days" writers, they just don't know what to do with them. Anyway. Pandanus is a big genus (500-1000 species5), a few dozen species of which are economically significant. Only two (utilis and veitchii) are common as houseplants, though other species are cultivated in other contexts. 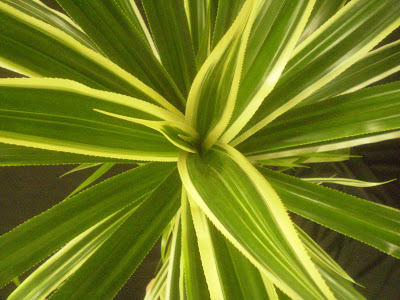 Pandanus amaryllifolius, or "pandan," in cultivation. Photo by dekoelie at Wikimedia Commons. See? I told you there would be cake. 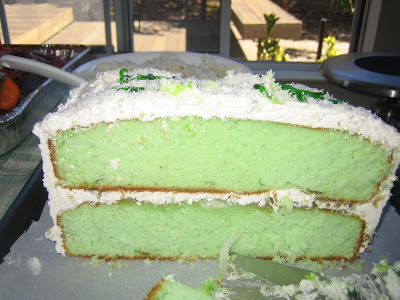 Cake made with pandan (Pandanus amaryllifolius) juice as flavoring (and coloring?). Photo by Glenn G, via Wikimedia Commons. Other Pandanus species of interest, which have all been cultivated as houseplants and ornamentals to some degree or another, include the more thoroughly hostile P. candelabrum, which has spines pointing both inward and outward, the small P. graminifolius, which maxes out at 2-3 feet (0.6-0.9 m), and the pretty but apparently delicate P. heterocarpus/ornatus. P. reflexa, which resembles some of your angrier Aloes, is particularly striking, though just looking at P. reflexa is enough to tell you why it never really caught on as a houseplant. Pictures of all these, plus a few others, can be found here. The geographic origin of screw pines is difficult to pin down, because they've been introduced all over the place, often quite a while ago. P. tectorius is common in Hawaii, for example, but different websites give different answers about whether or not it's a native Hawaiian plant.9 Other species are found in islands of the South Pacific, Madagascar, Africa, the Philippines, Australia, and throughout tropical Asia. Whether any of them are originally from these places is beyond my ability to determine. There seems to be some consensus that P. veitchii is from Madagascar. Wherever they started out, some screw pines are highly useful plants, so it makes sense that explorers would have brought a few plants along with them to plant elsewhere. In fact, P. utilis is so useful as a source of fiber for ropes, nets, baskets, paper, roof thatching, etc., that its botanical name means "useful." View from the top of the BDSP, looking into the rosette. The leaves of P. veitchii don't really spiral in the same way that P. utilis does. Speaking of names: "screw pine" comes from the plant's appearance, particularly that of P. utilis. The "screw" part of the name is because each new leaf emerges slightly to the right of the previous one, with the result that the leaves form a spiral as the plant ages.10 With P. utilis, the leaf scars on the plant's initial stem also have a spiralling pattern to them, though this stops when the plant begins to branch. The "pine" part comes from the fruits, which have woody seeds in clusters, somewhat resembling a large pineapple or pine cone though I don't see the resemblance so much myself. Fruit on P. utilis. For the seeds, imagine the same thing, but the color and texture of old wood, and split into individual pieces instead of all attached to one another like this. Photo by B navez, via Wikimedia Commons. 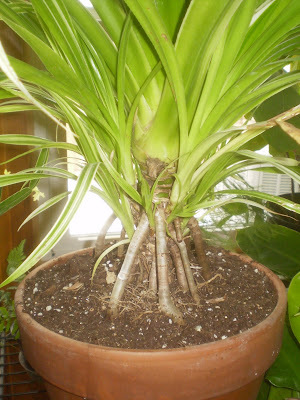 Since we're primarily concerned with Pandanus as a houseplant, I won't share all of the interesting stuff I found out about them as landscape plants, but I will note that both veitchii and utilis are capable of getting very large, though none of my sources agreed on a maximum size. Plants 25 feet (7.6 m) tall, and equally wide, seem to be fairly typical, though I ran into claims of 60 feet (18 m) tall for utilis. It is even recommended that they be planted no closer than fifteen feet (4.6 m) from sidewalks, unless you don't mind the sidewalk becoming un-navigable, because the plants get wide about as fast as they get tall. This is also true indoors, though it doesn't happen nearly as fast. The flowering and fruiting are another potential problem in cultivation; I found more than one source that said veitchii never flowers or fruits. This could well be true -- it's not like I found pictures of veitchii fruits or flowers -- but it just cries out for an explanation of some kind, and nobody but me seems to find the question interesting. Utilis, on the other hand, flowers and fruits quite freely once mature, and can produce hundreds of clusters of fruit at the end of the summer, each of which may weigh eight pounds (3.6 kg). Though the fruit may be left where it falls, it attracts fruit flies and squirrels, as well as other pests,11 and the seeds sprout easily. So if you fail to pick up the fruits promptly, you may end up with a plague of vermin, followed by a plague of seedlings to pull up. P. utilis plants are always either male or female, with only female plants producing fruit, but the female plants are, surprisingly, considered more desirable for landscapes. The explanation most sites give is that the fruits, while a pain to get rid of,12 are also pretty, or at least interesting, and the visual appeal of the fruits outweighs the hassle of cleaning them up. I've seen pictures of trees with full crops of fruit (e.g. ), and frankly, I don't think they're so cool as to be worth picking up hundreds of pounds of fruit every year. Different strokes, I suppose. The male plants have long, fluffy, tail-like flowers, which are fragrant if short-lived, and that sounds like a much better deal to me. Male flowers on a Pandanus utilis. I couldn't find any pictures I liked of the female flowers. Photo by B navez, via Wikimedia Commons. Both veitchii and utilis will branch with age, forming multiple heads. I don't know whether this happens with indoor plants. I suppose if one lives long enough, it would have to branch eventually. Utilis is prone to develop a triangular crown over time (e.g. ); I'm unclear about whether veitchii does this too. Both will, after a certain age, begin to drop leaves at a steady rate of about 10-15 per day, which are of course still spiny and sharp and need to be picked up all the time, lest they smother lawns, provide shelter for rodents, injure people, or rob a 7-11. Mature, branched specimen of Pansanus utilis. Photo by KENPEI, via Wikimedia Commons. Pandanus spp. are very salt-tolerant and relatively pest-free, so aside from having to clean up after them and plan carefully when planting them, they don't appear to require a lot of thought. They are also, according to davesgarden.com commenter IslandJim, traffic-stoppingly gorgeous when mature, and a large specimen may sell for $5,000 to $10,000 U.S. One possible down side is that screw pines can harbor, and be killed by, a bacterium "lethal yellowing," an extremely contagious and fatal plant disease which is spread by the leafhopper Myndus crudus.13 Outdoor plants also sometimes develop black spots on the leaves. There's no solid consensus on why the spotting happens,14 but removal of the affected leaves appears to be the best cure. As a houseplant, a lot of this is irrelevant: your plant is unlikely to be affected by lethal yellowing, it's not going to fruit or drop a lot of leaves, and it will probably not get twenty-five feet wide, either, unless you have a very large plant room. But like the old proverb says, you never know when you might be visiting Florida and need to identify a screw pine in somebody's yard. Ginormous stilt roots on P. utilis. Photo by Pandano at Wikimedia Commons. Both indoor and outdoor plants will grow stilt roots (sometimes called "prop roots"). I'm not quite clear on how it works, but it would seem that stilt roots are better at bracing a plant against winds in sandy soil than more "normal," underground spreading roots do. On outdoor plants, aerial roots can get to be three inches (8 cm) in diameter. 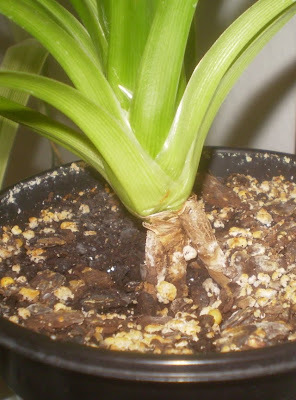 Rather than growing aerial roots that grow downward until they meet soil, like Monstera deliciosa, Pandanus spp. grow their roots below the soil first and then push themselves up out of the ground. This is a little freaky, but it's how it's supposed to be, so try to appreciate them. Nothing but frustration will result from trying to re-bury your plant's roots, though I suppose if you've got a lot of peroxide and band-aids you're desperate to get rid of, this would be a way to solve that problem. Stilt roots beginning to form on a very young P. veitchii. They'll also, unsurprisingly, try to get big indoors, sometimes fairly rapidly. I was surprised, for example, at how quickly the BDSP has grown, in just the two years we've known one another. It's not the blinding speed of an Ardisia elliptica or anything, but if the BDSP continues at this rate, it's going to need its own room within four or five years. Which I both want to happen and do not want to happen. The BDSP shortly after we first met, in October 2007. But anyway. 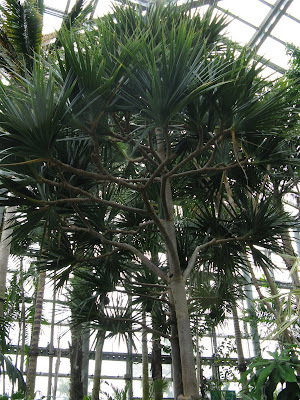 It's not at all difficult to keep Pandanus indoors, except for the size and spines. LIGHT: Give them as much sun as you can manage. Some of my plants have had to go without direct sunlight for a season here and there, and it didn't appear to cause any lasting harm, but only do this if you have to, since I'm sure mine resent it and will make me pay for it later. WATER: Water is one of the least problematic aspects of care. 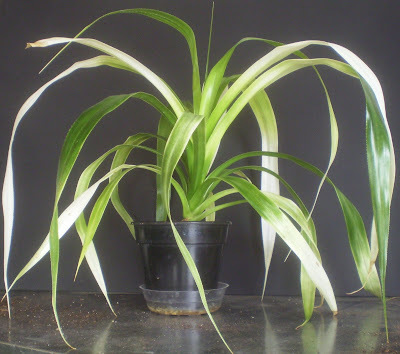 If allowed to get too dry, leaf tips will burn, and too much water will (allegedly16) lead to rot, but I think most people are already predisposed to water indoor Pandanus more or less appropriately. My own plants are kept on the dry side, and consequently get dry leaf tips occasionally. When it gets really bad, I take brown tips as a sign that the plant needs to be moved up to a larger pot. When I do, it's usually followed by a burst of new growth. TEMPERATURE: Most everything I've seen says that Pandanus shouldn't get colder than 55F/13C, which is weird, because if grown outdoors, they are supposedly hardy to 30F/-1C.17 So I question this no-colder-than-55 stuff, because I'm fairly sure that the BDSP didn't come inside this fall until temperatures were at least in the 40s (F; which equals 4-9C), possibly colder. And it was fine, as far as I can tell. On the other hand, some of the BDSP's leaves have browned recently, possibly from being up against the windows in the plant room (which is kind of unavoidable). I don't know how cold that actually gets, though. So, bottom line, keep your plant above 55F/13C as much as possible, but don't panic if it gets colder. HUMIDITY: Here's another case of conflicting advice and experience. Almost every source I've seen, whether on- or off-line, says that Pandanus spp. need high humidity in order to do well. It has not been my experience that air moisture is that critical, even taking into account that I have higher indoor humidity than most people.18 Your results may vary. PESTS: Outdoor plants can get scale (here is proof), but for all intents and purposes, there are no serious pests of Pandanus when kept as houseplants. Close-up of the base of the BDSP, showing the developing trunk in the center and the many, many, developing stilt roots and offsets around it. PROPAGATION: P. veitchii forms plantlets as it grows, sort of around the base of the main plant's leaves. This begins when they reach a certain age, and as far as I can tell continues ever afterward. Except for the first step, propagation from plantlets is extremely easy: you reach into the center of the plant, grab a plantlet firmly and pull it away from the plant, and then stick it in dirt. Plantlets will usually (always?) have at least one root already formed, so then it's just a matter of waiting for it to recover enough to produce new growth. To the best of my recollection, every plantlet I've tried to propagate has worked. P. utilis does not form plantlets. It can be propagated from stem cuttings, technically, though if you cut off a growing tip, the plant will not sprout a new one to replace it: the branch will just sit there, being a stump, forever after. So this is something to try only with older, already-branched plants, and then only if you don't mind leaving a leafless stump on the older plant. And there are easier ways. More commonly, P. utilis is propagated from the abundant seeds. I tried this once, with seeds from seedman.com, and it didn't work at all, but I think this is probably my fault for not keeping them moist enough, and for giving up on the process too early. One is supposed to soak the seeds in warm water for at least 24 hours, and possibly as long as five days, then plant in a moist medium (like maybe vermiculite or finely chopped sphagnum moss), keep warm and moist, and then wait for two to three months. I have no idea how easy this is when done correctly, but if the seeds are willing to sprout all over people's yards, I'm thinking they must have a pretty strong will to live. GROOMING: The BDSP has occasionally dropped some leaves, and pulling those off is never fun. The younger plants of mine haven't really needed any serious grooming at all, and drop leaves only very rarely. One of the stranger things I've seen with P. veitchii is that from time to time, new leaves will come in yellow instead of green. This happens on both plain-green and variegated plants. Sometimes the new leaves are solid yellow; sometimes they begin yellow and then turn green later; and sometimes the tip is yellow and the base is green. I saw one site attribute this to the season, and it does appear to happen more during the winter than the summer, but my personal inclination is to blame this on nutritional deficiencies, because it seems to stop briefly when I give them fertilizer. I haven't made a dedicated study of the problem, though, so I'm not sure it's nutritional. Whatever is going on, it doesn't seem to hurt the plants any: they keep producing leaves of the same size, at the same rate, and sooner or later, the yellow leaves turn green regardless. So it's not really a problem, but it's weird. See? Some leaves one color, some leaves another color, some half-and-half. WTF, Chuck? The BDSP, toward the end of the summer, and then for a little while after I brought it inside, was doing a thing where the newest leaves were staying attached to one another, turning the growing tip into a hard, spear-like point. I physically pulled them apart from one another a couple times (ripping a few leaves slightly in the process), and eventually it got over this, whatever it was, but I never figured out a cause. Possibly humidity or temperature. Really no way to tell. I wish I'd thought to get pictures. The potentially enormous size of the plant means it's not for everybody. The growth rate appears to be constrainable by pot size, to a point, and plantlets tend to be very slow to get going, but in the long run, you need to plan for a screw pine or you will be sorry.19 Once they decide it's time to get big, there's no stopping them. I've had offsets barely grow at all for a year and then suddenly quadruple in size in a few months. The BDSP in July 2009. FEEDING: Nobody has any specific advice on feeding, from what I've been able to find, and especially nothing that would be applicable to indoor growing, so this is kind of a guess, but since feeding seems to resolve the yellow-leaf issues sometimes, it's a fast-growing plant, and it's fairly salt-resistant, you maybe don't have to use quite as much restraint with Pandanus as with some other houseplants. I'm not sure what too much fertilizer looks like, with these, so start slow and increase as you feel the need to increase. I was really hoping that by the time I reached the end of the profile, I'd have found an explanation for screw pines' absence from the stores despite their prevalence in the houseplant books. I mean, there's nothing ambiguous about "the best houseplant there is," right?20 I found other people wondering the same thing, but nobody seemed to have any answers. Perhaps they were never that common to begin with. Perhaps they just don't sell well enough to be worth the pain and effort of producing them. Perhaps they're attending college. I welcome other theories, if anybody has some. Photo credits: Mine except 1) where otherwise noted and 2) the "Happy Days" cast picture, which I don't remember the source of and apparently didn't bother to write down. 2 Billbergia nutans, for example: I've never seen one for sale, but they're in a lot of the books. (Also on a lot of the websites, which causes me a certain amount of jealousy.) I don't think I've ever seen Cissus antarctica, Howea forsteriana, or Asplenium bulbiferum for sale, either. With Howea, I know why: they're hella expensive (even wholesale), but the others all seem like something I should have run into at least once, or at the very least should have seen on the availability lists at work. 4 I can verify that at least some Pandanus species contain some calcium oxalate crystals somewhere within the leaves. Whether P. utilis or P. veitchii do, and whether this is the reason for why the wounds inflicted by Pandanus leaves tend to itch for a long time, I couldn't say. But it seems like a reasonable theory. This also probably means that the leaves are unpleasant to chew when raw, as with other plants that contain calcium oxalate crystals (for example: Philodendron hederaceum, Schefflera actinophylla), though I didn't see any websites address their toxicity to pets or children directly. 5 Wikiposedly. I was unable to confirm this, either. Quite a few Pandanus species seem to have multiple botanical names, too, which makes it all that much more confusing. 6 This is the same plant called P. amaryllis. I'm going with amaryllifolius because 1) that's what Autumn Belle and davesgarden.com, as well as other reputable sources, use, and 2) it avoids confusion with the genus Amaryllis. 7 "Pandan" is said to be the native name for Pandanus species in general, and is the origin of the botanical name (plus an "-us" to make it sound properly Latin). I get the impression from reading Autumn Belle's post that if you're in Southeast Asia and you say you want pandan, P. amaryllifolius is what people are going to try to give you, even though other Pandanus spp. are probably also called "pandan." If you want to get specific about it, Autumn Belle says to ask for "pandan wangi," which distinguishes it from the other pandans. 8 The husband and I did wander in and out of all the Asian markets we could think of in Iowa City a while back, when I started writing this profile, which took most of an afternoon and wound up being useless: nobody had any rootable cuttings, nor any fresh leaves to smell, nor even any dried leaves, nor products flavored with pandan. Nor had anybody even heard of it, on the occasions when I tried asking somebody. One person tried pointing me to coriander, which . . . well, either this was a language barrier, or they were just throwing something out there at random to see if I'd go for it. Seemed more like a language problem. This was very frustrating, though it's possibly not fair to expect stores to carry the product on the off chance that one guy in Eastern Iowa happens to hear of it and want to buy some. I will continue to try, but it looks like probably if I want pandan I will have to order a plant from Hawaii, Florida, or someplace like that. I did find a place that sold it from Florida, and I hope I still have the site bookmarked somewhere. 9 I think the people saying it was introduced probably have the better case, but that's just me. Native Hawaiians appear to be happy to claim it as a native, though they're relative newcomers themselves, on an evolutionary/geological timescale. 10 The arrangement of leaves is completely different in P. veitchii. Though the name "screw pine" is used for all Pandanus species as far as I know, the actual shape of the plants varies somewhat. 11 Some Pandanus spp. are said to produce edible fruits, or at least fruits which are edible if cooked first, but as best as I can tell from the conflicting information I've seen, utilis fruit is either outright inedible or is edible but not very tasty. 12 It's apparently possible, with a sufficiently large plant and a sufficiently dedicated gardener, to collect enough fruit to fill several garbage cans every day for several days. 13 Lethal yellowing is technically a "phytoplasma," which is not a virus but a bacterium, but for some reason people like to call it a virus on-line anyway. I don't know how that got started, or why it persists. Lethal yellowing affects some species of palms, including houseplant species like date palms (Phoenix), coconut palms (Cocos nucifera), and possibly the panama hat palm (Carludovica; unfortunately, the plant typically sold as Carludovica is, I think, more probably an Asplundia, and I'm not sure which genus is susceptible to lethal yellowing, or whether either is. ), and can wipe out susceptible species in a given area very rapidly. Everybody makes lethal yellowing sound pretty dire; I don't know how widespread or dangerous it actually is. Possibly anything with "lethal" in its name is going to sound dire (e.g. lethal rainbows, lethal kittens, lethal cupcakes). Treatment is possible, but involves injecting antibiotics directly into trees, over long periods of time, and looks expensive. 14 One school of thought is that it's a normal leaf reaction to cold, wet conditions, possibly a fungus; the other main theory is that it's caused by insects burrowing into the leaves. The second option makes more intuitive sense to me (at the very least it seems like it would be more easily disproven, if wrong, so the fact that people are repeating it suggests that it's not been disproven and is therefore probably right), but I've not seen this problem in person, nor even any pictures of it on-line, so that's entirely based on my gut, and the reader should be warned that my gut is frequently wrong, which is why I try to think with my brain as much as possible. 15 The red-spine thing is possibly not true for plants grown in inadequate light. 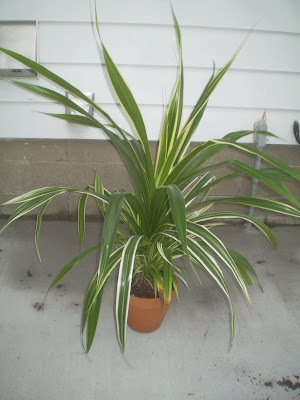 Also, one davesgarden.com commenter mentions a variegated Pandanus in the comments for P. utilis, but I think they are probably thinking instead of veitchii or baptistii or some other species, as his/r comment is the only time I saw anybody mention a variegated utilis. 16 I haven't seen this myself. 18 Because of all the plants I have, and the terrarium, and the aquarium in the basement, and the small pans of water in front of some of the heat vents. We in fact have a slight issue with water condensing inside the roof, which the husband informs me can turn into quite a bad thing. I've discussed this with the plants, and they are unwilling to accept lower humidity levels in exchange for a roof that stays intact and doesn't grow mold. Even after I explained that this isn't really in their long-term self-interest, they still maintain that they'd rather have high humidity now than a roof later. Which now that I think about it is kind of insulting: clearly some of them don't think they're still going to be here very long. 19 Actually, you may be sorry whether you plan or not. Getting your arms and/or face all scratched up on a regular basis gets old. 20 Of course, for all we know, he's heavily sedated now, and in an institution for the criminally insane. I mean, there's no reason to take that one guy's word for it unquestioningly. I've never seen or even heard of anyone else who had a Screw Pine. I bought mine while in collage. I have wondered ever since why someone would be selling large houseplants out of the back of a semi truck in a strip mall parking lot but at the time I just thought "big plants, cheap!" Mine grew, and grew, and grew (but never branched) until it finally got it's own room. That's right. The tiny dining room in my first house was christened the Screw Pine Room. And the plant took up nearly the whole space. Sadly the story has a tragic ending. During divorce proceedings the screw pine got "accidentally" put outside during the winter and died. Well, that's my ex's story. While I loved my screw pine I have no space for another giant round, pokey plant in my current home so it will just have to live on in sweet memories. Between the spines and the size I'm not surprised they aren't more common. Thanks for reminding me of this great plant. We sell 2 varieties of Billbergia nutans. We've talked about adding Pandanus but haven't got around to it. I'm not aware of many other people who have them; there have been a couple mentions of them at the House Plant forum at Garden Web, one of whom sent me some solid green veitchii offsets a long time ago. The people who have them do, by and large, seem to like them, though yours is the first case I've heard of where one actually got its own room. I didn't know there were multiple varieties of Billbergia nutans. As for Pandanus, it seems likely that you'd have better luck selling them than we did, having more people in the vicinity and customers who are (I'd assume) less averse to sharp, pointy plants. But I can understand not tripping all over yourselves to try to get some in, too. Damn. You need to write a book, seriously. Because your posts are the most informative and eclectically fascinating (and laced with humour) about indoor plants I've ever seen. I knew nothing about this plant until reading about it here. Bravo, as always. I've only seen a few P. utilis plants, all at the Toronto Zoo but I love them. The spiral pattern of the leaves, red thorns, even the size (though that's what ultimately will keep me from getting one for a long time). Variegated P. veitchii is such a gorgeous plant. We had a couple at work (only ten or so at a time at most) which we propagated ourselves. They made nice plants for big office buildings, but other than that, I don't think they ever sold at all. Between looking around for one and your descriptions, I kind of want one now. However my atrium is currently under siege by a huge burgundy hibiscus that wants to occupy all available space. So I'm not sure what I would do with it. A lot of these Pandanus are very common here in the Philippines and Southeast Asia. Most of them are in marginal lands left on their own to propagate or to die, to follow "survival of the fittest".lol. Pandan is a very common food flavoring for dessert and there is already a commercially available package in the market. "Buko-pandan" is a common dessert composed of young shreded coconut meat flavored with pandan extract and sometimes mixed with nata-de-coco or gelatin, condensed milk and cream. Hmmmm, it is delicious. We have lots of recipes for it actually. Pandanus amaryllifolius (fragrant pandan) is widely available in the wet markets and hypermarkets here. It also grows wild in the countryside and may be invasive. If you happen to visit South East Asian countries, do try our green coloured deserts, confectionary and dishes with pandan in the name. If you come across this plant, the acid test is to smell the leaves, it must have an aromatic smell. I am delighted and humbled by your kind mention of me in this well written post of yours. Thank's a gazillion. Oh yes, I'm so glad to see the familiar faces of Happy Days here. It was my fave TV show eventhough our TV station broadcasted it many years late. I didn't know Chuck Cunnigham existed until you mentioned it today! I have about 30 'babies' from 3 original pandanus P. veitchii plants that my grandma had in Milwaukee back in the 40s and 50s. They grow best in pots with no drainage. I have been saving them since the mid-1980's. There seems to be no rhyme or reason to the coloring/striping on the new plants. They truly are the BEST houseplants. In addition to awesome pandan-flavored desserts that Andrea mentions are common in the Philippines, from time to time we would also steam rice with pandan leaves thrown in to add aroma. Marnie, Am interested in one of your pandan babies. My email, palmtravelatyahoodotcom. Thanks. I have one descended from my great grandmothers plant c. 1940. They grow huge,When it gets to 4 ft. I just propagate the babies and start over. Indestructable for sure. I'm wondering if you know of any Pandanus species that have both edible fruit and leaves. Preferably with non-serated leaves. I'd love a Pandanus am. but I'm said it rarely produces fruit (from what I've read and that utilis doesn't seem that edible). There were eating some on survivor. Maybe I should find out where it is this year and see which species are indigenous. Well, my P. amaryllifolius story has a tragic ending anyway, so. I don't know, off the top of my head, which species would have both edible foliage and fruits; I haven't looked at any of that since writing the profile, and I was pretty focused on veitchii, utilis, and amaryllifolius when I did so. I'd expect that most of them would have foliage that was edible when cooked, but that's actually not much better than an educated guess, and by "edible" I mean more that I don't think it would kill you than that I think it would be delicious. I've been alerted by my feeds of new comments here. I didn't realize it's been here for a long time. I also realized a have a post on P. utilis too.(http://abagillon.blogspot.com/2010/07/this-fruit-can-be-unusual-for-you.html). I've seen also some P. tectorius in other parts of the country and an unknown species bearing different kinds of fruits, however i was on a boat and can't get a more distinct photo, though i have it in memory! We have a lot of domesticated P. amaryllifolius though. I found my first Pandanus veitchii at a flea market and grew it for a number of years. I finally got rid of it when it began aggressively scratching up my toddler (plus I didn't really have enough light at the time and it was declining). Just 2 weeks ago I finally found another sticking out of a garbage can (of a family with young kids, by the way) and ripped off a plantlet. Since my kids are now long grown up, I figure I'll try again. I tried growing a Pandanus veitchii plantlet a few years ago, but all new growth was cream, not even a speck of chlorophyll and I assume the plant must have starved to death. On my travels in Indonesia I picked up a Pandanus dubius seed. Whilst not amazingly fast growing, the plant has been putting out leaves steadily and is becoming rather thick. 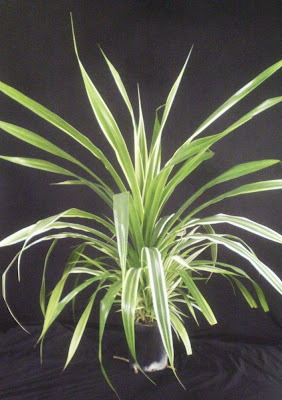 Pandanus dubius is my favourite species as the glossy leaves are wide and have a beautiful bright shade of green. Young plants look so robust, almost like large bromeliads. It throws out plantlets like no tomorrow, but provided these are thinned out, the central crown develops into a sturdy plant. If you can get hold of it I'd really recommend keeping one. In its natural habitat it is an understory plant so grows well in the shade. Plants grown in the sun turn a nasty shade of yellow. Hey! Just wanted to thank you for the informative article. I have been researching the back stories of all the tropicals we have at work and it is rather exciting to come across an informative article that is also pleasant to read! Low humidity is definitely an issue for this plant. I brought mine to a low humidity (~5%) spot in order to get it more light, and it just about dried up and died. Every other aspect of the conditions was OK, so I'm quite certain it was the humidity. Without having any knowledge or sight of the Screw Pine family here in Johannesburg South Africa purchased this Pandanus Screw Pine from a Garden Depot in the neighbourhood after being attracted to the exotic formation of the glossy bright green strap-like leaves with sharp reddish edges on the leaf margins and underside . After doing a little research to identify my plant which I have been told looks closely like and resembles a Pandanus Utilis, found that a member of the species Pandanus Multicarpus is on the world plants endangered list. My guess which may be as good as any, is whether this may be a collective effort to distribute this beautiful plant the 'Pandanus Screw Pine' distantly - as much as we through language are trying to preserve the 'mother tongue' lest it should be isolated and forgotten. Pretty picture: Hyacinthus orientalis cv.